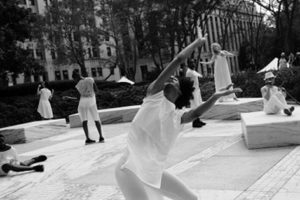 Adults are needed to participate in a movement installation for the Northern Virginia Fine Arts Festival. Artist Heidi Latsky plans to “celebrate the beauty of differences” with a movement installation titled “ON DISPLAY/RESTON.” The installation is a sculpture court where the performers are the sculptures, according to the Reston Community Center. The Reston installation is a local platform for a worldwide initiative called “ON DISPLAY,” which was created by a partnership between Heidi Latsky Dance, a New York City dance company, and the United Nations to celebrate the 25th anniversary of the Americans with Disabilities Act. Men and women age 18 and older are able to participate — no formal dance experience is required. “Diversity and the most inclusive range of ability are welcome. The movement installations will involve focus, stillness and structured improvisation,” according to the press release. The three-day festival at Reston Town Center is set to start on Friday, May 17, and last until Sunday, May 19. More than 200 artists are anticipated at the festival.